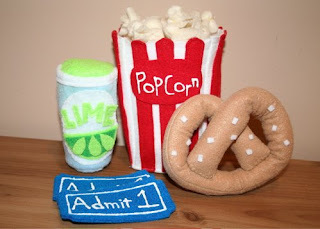 Sew Can Do: Movie Time! This fun little group was a the culmination of several Christmas presents. The patterns to make this set is from Bugga Bugs. I fell in love with how cute they were and really wanted to give them a go. I'm thrilled with how they turned out, but I discovered a couple of things: the majority of the instructions called for hand sewing and that I hate that much hand sewing. It's really hard for me to keep stitches nice and neat. While I try to go slow & be careful, it still looks like a 2nd grader did it, so I tried to machine sew and fabric glue as much as possible to save time and sanity. After cutting all the pieces & interfacing and stitching them all together, the pattern called for making 45 individual popcorn kernels and then stitching each one in place. I made about 15 and strung them together like popcorn garland and stitched those strands on top instead. There is a Dots candy box & pieces and some red vines in this pattern that I didn't feel like doing now, but I may get to later. Ironically, right after I finished these we took the kids to the movies. Obviously we did not take these goodies with us. I also got the Mixer Set pattern which looks like it will be easier with my machine & glue shortcuts, so I may tackle those next week. I am also happy to report this is a very eco-friendly item - the eco-felt made from recycled pop bottles and stuffed with bamboo fiber-fil, both made possible by Joann's gift cards from my sisters. I really enjoyed using the naturally soft bamboo, so I've got some ideas for some more upcoming projects. Somewhat related note: I picked up a new cutting mat since my old one had a slight warp mishap with an iron, but when I got it home I was appalled to see this on the label: Warning - this product contains chemicals known to cause cancer, reproductive harm & birth defects. Yikes!! I did a little research and it appears most self-healing mats are PVC, which is something I actively avoid - PVC off gases vapors that are harmful for our bodies and is horrible for the environment (see here). So the mat is going back to the store. Online I found there are some translucent mats made from polyethelene (#2 plastic), so I'm hoping to find one locally or order one online. Just goes to show - you really have to check everything for the unexpected. I have been wanting to try making faux food but just haven't gotten around to it. You did a great job. Reading your posts....I see you are addicted to sewing....Come vist me and you will see - I too and addicted to sewing!